I’ve been developing an interest in B&W photography after reading “The Power of Black and White” by Piet Van den Eynde. It’s more than just an awesome e-book on black & white photography, it’s more of a master class in approach and post processing techniques. After reading this book I decided to put a few of the things I learned into practice and see what kinds of images I could come up with. I picked one of my favorite images from my 2005 trip to Indonesia which was a late night market that took over a street in Bandung. Local farmers setup shop and sold all kinds of fresh fruits and vegetables. The dynamics of the market were fun with vendors trying to get us to buy their produce. 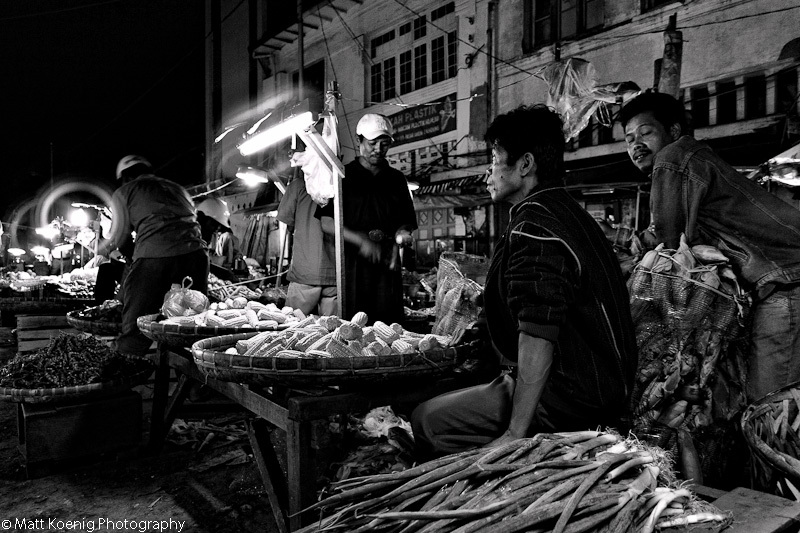 Since this was a night market I wanted a high contrast image that was heavy in blacks to create that night feel that I remember so clearly. I went heavy on the blacks slider and contrast slider. I used an adjustment brush to lighten up the bins of corn and the faces of the vendors. If you are interested in learning more about B&W conversions in Adobe Lightroom check out the e-book. It’s only $5 from Craft & Vision.